THE REAL MEETING WITH LORD GANESHA - welcome to the MAURITIUS POORNAWAD HOMEPAGE..
HIS REAL MEETING WITH THE GOD.. LORD GANESHA. 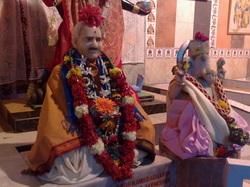 In this article we will actually tell you how Rev Ramchandra Maharaj met with lord Ganesha. Most of the people who does not belive in god will say we are making vague statements but as you know it is possible to awaken the sleeping person but not the one who is acting asleep. So leaving such people aside we are continuing our journey to know more about poornawad and Rev Ramchandra Maharaj Parnerkar. One evening Master Ramchandra Maharaj parnerkar was on the terrace in a restless mood and Lord Ganesha appeared before him in the form of ‘Child Ganesha’ - the very form of Ganesha the Master worshipped. The child Ganesha sat next to him and looked at him with benediction, put his hand overthe Master’s head and lovingly patted him. it was the most startling event that could ever happen in the realm of human consciousness. It was not an illusion but a reality. Numerous are the instances in the spiritual history of India when God has been face-to-face with his devotee. This was yet another such instance- Dr. Parnerkar having vision of Lord Ganesha sitting face-to-face. The mere touch of lord Ganesha had cleansed all the doubts in his mind and turned it into a spotless bright mirror. Lord Ganesha charged Dr. parnerkar with a divine mission and asked him to undertake the task of ‘Gurutva’ - Masterhood. Lord Ganeshas’ words were redeemed when L. K. alias Dadasaheb Deshpande of Shrirampur (A city in India Dist Ahmednagar) became the first disciple of the Master. That day-Vyas Pournima of 1949 - Shri Deshpande worshipped master with sixteen vedic rituals. Thus at the early age of 32 years Dr. Ramchandra Maharaj Parnerkar attained Masterhood.